Waterford goalkeeeper, Aaron Beresford is a big doubt for Waterford’s Munster SFC opener with Tipperary after picking up a nasty injury at training this week. 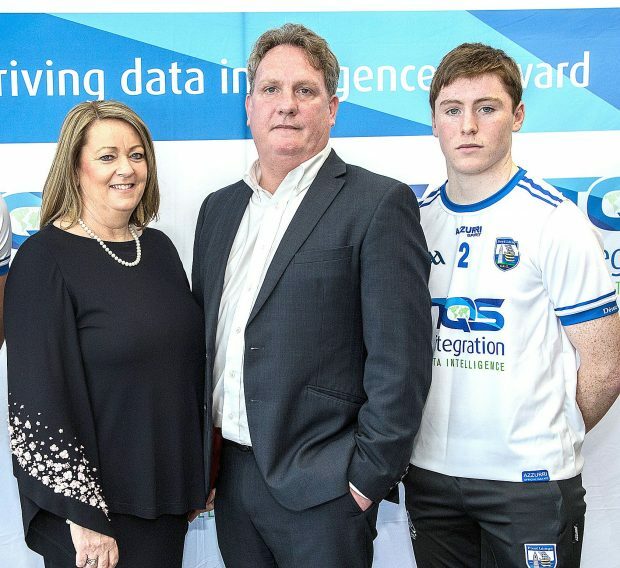 Here he was at the announcement of TQS Integration’s 2019 Sponsorship of Waterford GAA County Teams with Marie and Tom Quilty of TQS. Photo: Sean Byrne. Waterford goalkeeper Aaron Beresford dislocated his knee in club training last week just a month before the Munster championship clash with Clare in Ennis. He was on crutches at the Ballinacourty-Brickey Rangers match on Sunday night. Beresford made his league debut against Wicklow in January and started six of the seven Division 4 fixtures. Club mate Stephen Enright came in as emergency cover against Antrim, after stepping back from the inter county scene earlier in the year. Gaultier’s David Whitty might be in line for his championship debut in Cusack Park after getting the nod away to Leitrim in the last round of the league.